Early arthritis clinics (EACs) have been well established since 1980s. Most of the data for their effectiveness comes from rheumatoid arthritis (RA) management and is largely limited to process outcomes. There is little evidence that such clinics improve clinical outcomes particularly for psoriatic arthritis (PsA). We examined whether EACs provide better outcomes irrespective of final arthritis diagnosis. 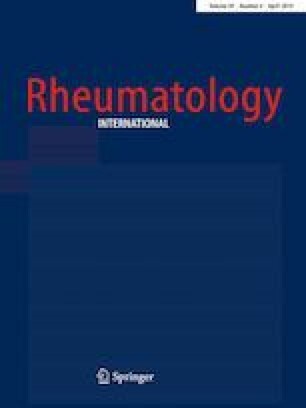 A 52-week prospective observational study of all inflammatory arthritis patients presenting to early arthritis service at our secondary care hospital in 2016 was undertaken. A protocolised approach to the early initiation of therapy (within 3 weeks) and 6-weekly review of treatment outcomes was embedded irrespective of the arthritis diagnosis. Statistical analysis was undertaken using Mann–Whitney U test for disease activity scores to ascertain the significance of outcomes. Of 1884 patients referred, 482 (25.5%) were triaged into EACs based on set criteria. 159 (64.3%) had RA, 55 (22%) with PsA and 33 had other inflammatory arthritides. Mean DAS28 for RA at first visit was 4.65 (0.6–8.0). Treating to target achieved DAS28 remission for 84 (53.5%) and low disease activity (LDA) for a further 44 (34%). Median time to achieve remission or LDA was 20 weeks (0–52 weeks). Mean tender (TJ) and swollen joint (SJ) counts for PsA at first visit were 8.2 (1–35) and 3.5 (0–14), respectively [n = 55]. The patient (PtGA) and physician (PhGA) global assessments mean were 3.0 and 2.9 (1–5). Target [TJ and SJ ≤ 2] was achieved for 38 patients (69%) and good PsARC response for a further four (7%). Median time to achieve the target or good response was 22 weeks (0–48 weeks). Final TJ and SJ mean was significantly better at 1.2 (0–4) and 0.3 (0–2) [p < 0.0001] with similar improvement in PtGA [mean 1.8 (1–4)] and PhGA [mean 1.6 (1–3)]. Dedicated EACs help achieve good clinical outcomes in majority of patients with RA and PsA. Nearly 80% of our cohort attained the target or good disease response in less than 6 months. This was despite a significant delay in patients presenting to their GPs and moderately high disease activity. Concept: MKN; design: MKN; data collection and/or processing: MKN; analysis and/or interpretation: MKN; literature search: MKN; writing: MKN. All procedures performed in studies involving human participants were in accordance with the ethical standards of the institutional and/or national research committee and with the 1964 Helsinki declaration and its later amendments or comparable ethical standards. Approved on 30 Aug 2016 by Luton and Dunstable University Hospital (approval number 8/2015-16/Medicine/Rheumatology).